Brown Pelicans are quite popular in Louisiana. One of the state’s nicknames is “The Pelican State,” the bird is on the state’s flag, the state seal, the state painting (yes, apparently states have official paintings), as well as on one of Louisiana’s bicentennial coins. Officially designated as the state bird in 1966, the Brown Pelican has since enjoyed its status. 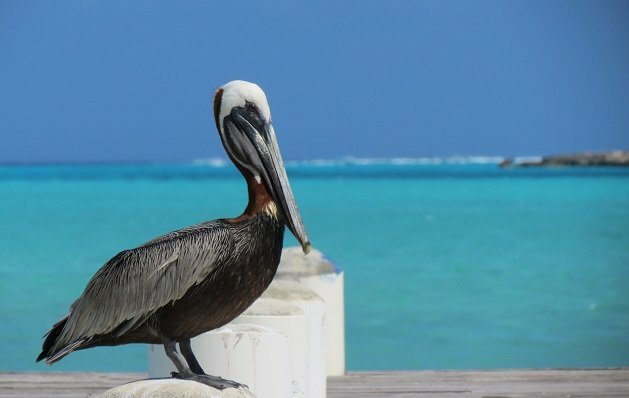 Good thing too – Louisiana is the only state that has named the pelican its official bird. It’s easy to see where the fascination with pelicans lies. They are large birds, with a wingspan that can reach over 78 inches. They are easy to see along the Pacific, Atlantic, and Gulf Coasts, soaring through the air or during their spectacular aerial dives into the water. In fact, of all the world’s pelican species, only the Brown Pelican and Peruvian Pelican perform those plunges. These dives – for small schooling fish – can begin at a height of 65 feet, and after they have made their catch they must let the water slowly drain from their bills. Brown Pelicans are also an example of a conservation success story – aided by Louisiana’s official state bird designation. In short, pesticide use in the 1950’s and 1960’s almost wiped them from North America. In 1961 they stopped breeding in Louisiana and a few years later disappeared altogether, prompting the legislature to name them the state bird in 1966. To try to regain the species, state officials even brought in fledglings from Florida, a program that continued until 1980! In 1970 the Brown Pelican was listed as nationally endangered. After DDT was banned in 1972, they began to recover, and in 1985 eastern Gulf Coast and Atlantic populations were removed from the list, while in 2009 Brown Pelicans were completely de-listed. Though the Gulf oil spill has threatened their numbers again, birders and non-birders alike can delight in the antics of pelicans in coastal regions all over the United States and of course, Louisiana.